Who Moved My Cheese? is a simple parable that reveals profound truths. It is an amusing and enlightening story of four characters who live in a "Maze" and look for "Cheese" to nourish them and make them happy. Two are mice named Sniff and Scurry. And two are "Littlepeople" -- beings the size of mice who look and act a lot like people. Their names are Hem and Haw. "Cheese" is a metaphor for what you want to have in life -- whether it is a good job, a loving relationship, money, a possession, health, or spiritual peace of mind. And the "Maze" is where you look for what you want -- the organization you work in, or the family or community you live in. In the story, the characters are faced with unexpected change. Eventually, one of them deals with it successfully, and writes what he has learned from his experience on the Maze walls. When you come to see "The Handwriting on the Wall," you can discover for yourself how to deal with change, so that you can enjoy less stress and more success (however you define it) in your work and in your life. 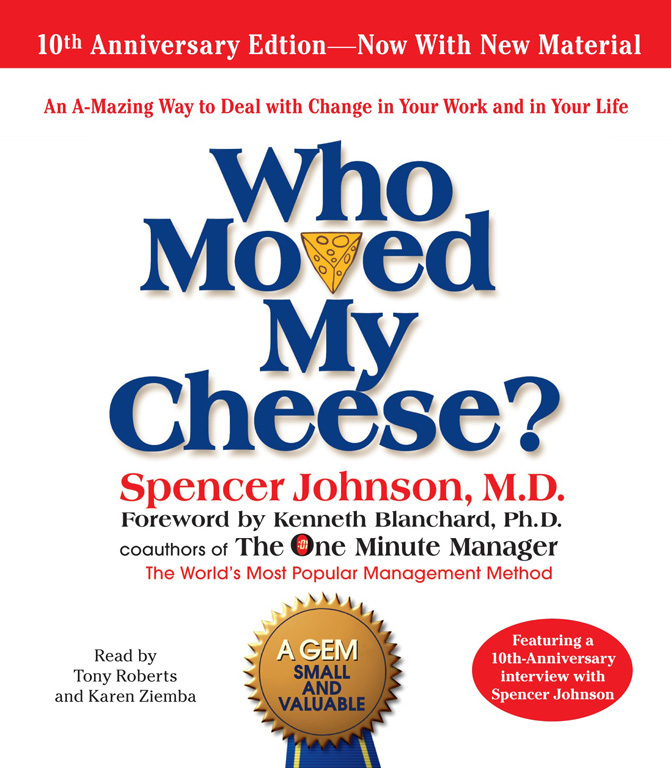 The 10th anniversary audio edition of Who Moved My Cheese? includes exclusive new bonus material in which Spencer Johnson offers fresh insights on its origins, impact and applications that will help you put its powerful wisdom to work.